In the vast areas of Colombia’s countryside where evidence of government is scarce, you can see the bright green bushes once again growing up to the roadside. They’re usually knee-high, indicating that they were planted recently. They’re in the same parts of the country as before: farmers don’t seem to be cutting down new forest and growing in new areas. Usually, it is one of several cash crops on a farmer’s land: at least some of the legal crops are more profitable, he or she will tell you, but with prices fixed by armed groups or organized crime, coca offers the steadiest income. Cocaine production is increasing along with the coca bushes. In 2016, Colombian security forces, mostly the police and navy, seized 379 tons of the drug, shattering earlier records and more than doubling the annual haul between 2010 and 2014. And Colombia has already interdicted 51 more tons in the first two months of 2017. Though evidence-based research has cast doubt on illicit drug supplies’ ability to drive demand, U.S. authorities say that the coca boom is affecting cocaine consumption in the United States, which—though still at decades-low levels—is increasing for the first time in several years. In 2015, the National Survey on Drug Use and Health [PDF] found a second consecutive annual increase in past-month U.S. cocaine users. 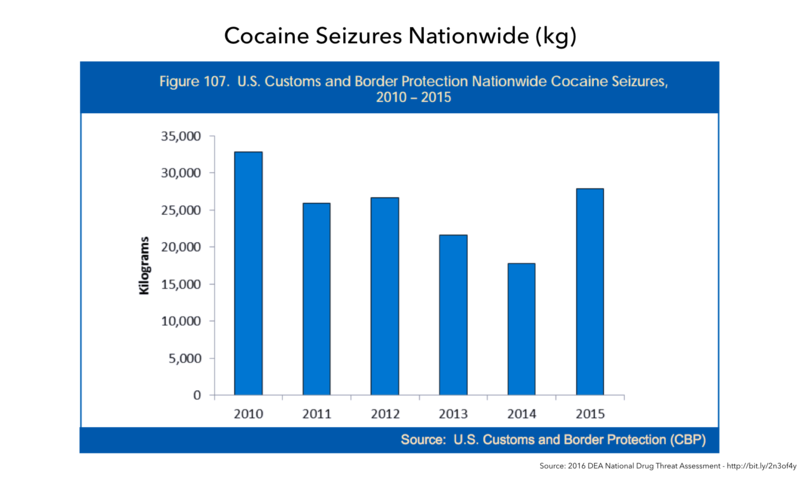 The State Department’s March 2 International Narcotics Control Strategy Report (INCSR) stated [PDF] that “the number of overdose deaths within the United States involving cocaine in 2015 was the highest since 2007.” U.S. Customs and Border Protection seized 56.7 percent more cocaine in 2015 than in 2014, according to the Drug Enforcement Administration [PDF]. 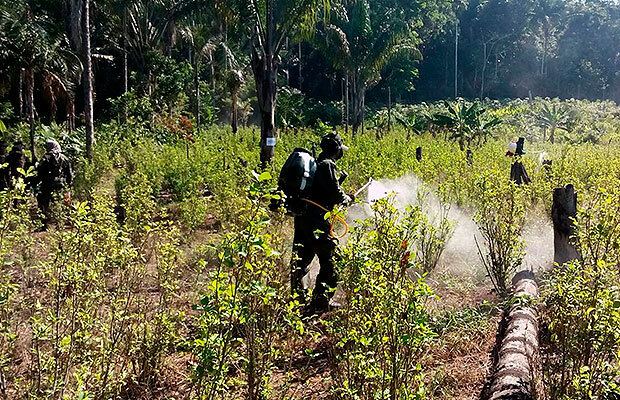 In October 2015, the Colombian government suspended its U.S.-backed program of “fumigation”—aerial spraying of the herbicide glyphosate—and has been slow to replace it with any other policy, whether punitive or assistive. The suspension came after a World Health Organization literature review) determined that glyphosate is “probably carcinogenic to humans.” The fumigation program was controversial throughout its 22-year existence, as rural dwellers complained of health ailments, growers found ways to work around the spraying, and eradication was poorly coordinated with efforts to build a state presence in abandoned areas. Colombia reduced other, ground-based forced eradication. Massive forced manual eradication—soldiers, police, or paid civilians pulling coca crops out of the ground—contributed to post-2008 decreases in coca growing. But they proved costly too, as more than 200 eradicators or their police and military protectors have been killed over the past decade, and another 1,000 have been injured, mostly by guerrilla or paramilitary ambushes, sniper attacks, and landmines and IEDs planted in the coca fields. More recently, eradication efforts have met with organized opposition, like protests and blockades. Manual eradication in 2015 was less than one-fifth the peak amount of 96,000 hectares in 2008. Besides danger and conflict, Colombia’s government argues that the manual eradication program is very expensive at a time when falling commodity prices have tightened budgets. Efforts to bring government into coca-growing zones, as well as alternative development and voluntary eradication programs, did not increase after the suspension of fumigation. The UN Office on Drugs and Crime’s July 2016 report on Colombia [PDF] noted “a general reduction in alternative development in the entire country.” This is only changing now, as Colombia takes first steps toward implementing the November 2016 peace accord with the FARC guerrillas. The price of gold fell. Illicit precious-metals mining served as a sort of “alternative development program” in many areas during the early 2010s, when the worldwide financial crisis pushed gold prices to stratospheric levels. The price has since fallen, causing organized crime to turn back to cocaine. The dollar has become stronger, rising from 1,800 pesos in 2013 to about 3,000 Colombian pesos today. While farm-gate prices of coca didn’t increase in dollar terms, they did increase handsomely in peso terms: a kilogram of coca leaf jumped from about 2,150 pesos in 2014 to 3,000 pesos in 2015, the UN reports. This likely has enticed more would-be growers. Word spread about the benefits coca-growers would receive from the peace accords, encouraging some farmers to become coca growers. In May 2014, the Colombian government and FARC announced a draft accord on “solution to the problem of illicit crops.” It committed the government to signing agreements with communities of coca-growing families, in which they would voluntarily eradicate their coca in exchange for benefits. (Most of these benefits, like land titles and access to markets, are things that governments should be doing anyway.) Over the next two and a half years, word spread that the government would be essentially subsidizing people who planted coca, a message that, according to the State Department INCSR, the FARC spread actively. Coca-growers’ organized resistance halted manual eradication in several areas. The government, in the middle of peace talks with guerrillas, decided not to respond in a way that would trigger a wave of violent confrontations with farmers in areas of FARC influence. Unfortunately, neither did the government respond with an increase in non-security presence or basic services. The coca boom’s causes are complex, and Colombia’s government is hoping that the U.S. government will respond in a manner that recognizes this complexity and joins it in pursuing a lasting solution within the peace accords’ framework. Colombian media have expressed worry that, with a conservative U.S. administration and Congress, the bilateral relationship might once again “narcotize.” The term refers to making drugs the main thing the two governments talk about, along with a return to 1980s rhetoric and get-tough policy prescriptions that yield only short-term results. This is accompanied by a fear that U.S. support for implementing Colombia’s peace accords may also dampen. Washington hardliners, alarmed by the coca numbers, may call on Colombia to get tougher with coca-growing families and bring back fumigation (which the FARC peace accord discourages but doesn’t prohibit). William Brownfield, the U.S. Assistant Secretary of State for International Narcotics and Law Enforcement Affairs, was in Bogotá last week to discuss the coca situation. During the Obama administration, he and other U.S. officials voiced disagreement with Colombia’s decision to suspend fumigation. It’s not clear exactly what assistance Brownfield was able to offer, as the White House’s deep proposed cuts to worldwide U.S. foreign assistance—as much as 37 percent—have placed in jeopardy any post-accord increases in aid to Colombia. One troubling outcome could be cuts to U.S. support for the essential tasks of implementing peace accords—increasing governance and territorial presence, implementing programs for victims—in order to pay for forced eradication. This would be a grave mistake. Colombia has a plan for reducing coca cultivation: it’s in the peace accord on “solution to the problem of illicit crops,” and it is to include the participation of thousands of former FARC members. This plan deserves support, as long as Colombia is serious about implementing it. Implementation has started—slowly—as the government has signed agreements with local associations of coca-growers in a few parts of the country. But the overall government response is muddled. In response to mounting concerns about the coca boom, President Juan Manuel Santos has announced plans to eradicate 100,000 hectares of the crop this year, up from less than 18,000 in 2016. Of these, 50,000 hectares are to be the result of forced eradication, and 50,000 are to come from voluntary agreements. But the two objectives both seem wildly ambitious, and may not be running in parallel. With U.S. backing, the eradication side is off to a faster start. It is taking place with an increased military role: Colombia’s army has already eradicated 6,000 so far this year, and the Defense Ministry has created Strategic Operations Centers to manage eradication campaigns in three locations (Antioquia, Nariño, and Norte de Santander). Sometimes, the eradicators (who may also be police or civilians) pull the plants out of the ground. Increasingly, they are spraying glyphosate—not from aircraft flying from dozens or hundreds of feet above, but from shoulder-mounted backpack sprayers. The arguments for using the chemical are that IEDs and landmines make it too unsafe to get too close to the plants, that this form of spraying is far less indiscriminate than aircraft (avoiding spraying homes, schools, water supplies, legal crops, and livestock), and that coca-growers themselves usually use glyphosate to kill weeds in their fields. The “voluntary eradication” effort foreseen in the peace accord is already underway, but on a more pilot basis. Coca-growers’ associations have formed in several parts of the country to negotiate eradication agreements with the government, and many are affiliated with a national structure called the Coordinator of Coca, Poppy, and Marijuana Cultivators, or COCCAM. Communities have signed eradication pacts in parts of Caquetá, Guaviare, Norte de Santander, Putumayo, and Vichada. Taken together, the pacts signed so far involve 55,000 families growing about 38,000 hectares. Each family may receive assistance valued at about US$10,000 over two years, as long as they verifiably eradicate their coca within a year. (These accords alone will cost about US$275 million per year for two years.) Assistance is reportedly to include land titling, which is desperately needed, but may not—at least not for a while—include necessary elements like farm-to-market roads and a more permanent government presence. Troublingly, there have been reports of forced eradication in communities that are either negotiating or have signed crop substation agreements with the government under the terms of the accord. On March 1, coca-growers in Los Alpes, Guaviare saw police forcibly eradicate their crops the day after they signed a voluntary eradication accord (the government has since suspended forced eradication in that zone, for now). This stands in stark contrast to the spirit of consultation and collaboration with local communities enshrined in the peace deal. Even if they owe more to lack of coordination than to bad faith, such practices could undermine accord implementation in certain areas of the country. Manual eradicators in Los Alpes, Guaviare on March 1. Photo posted by Colombia’s Verdad Abierta investigative journalism website. Another concern is the Colombian government’s capacity to implement what it has promised to do, whether in the peace accords or elsewhere. Its sorry performance in setting up twenty-six small sites for the FARC guerrillas to disarm—after months of advance notice, most were patches of dirt when guerrillas began arriving in early February—is perplexing. Establishing a functional, low-impunity state presence in vast ungoverned territories is essential if Colombia is ever to lock in permanent reductions in coca cultivation, to halt the terrifying current wave of attacks on social leaders, and to prevent other illegal armed groups from assuming control of previously FARC-dominated areas. Governing abandoned areas is a complicated task, but it should be eased by the historic exit of a hostile insurgent group. Map highlighting (in dark red) zones of Colombia that badly need government presence, from a July 2016 Colombian government presentation at the Wilson Center. Colombia has a plan and recognizes the problem, and the U.S. government can help. But this plan won’t achieve immediate results. Yes, Colombia needs to move faster to implement its commitments. But we strongly counsel against demanding action for its own sake, “narcotizing” the relationship and urging Colombia to return to policies that look tough but didn’t work in the past. Do not force Colombia to give up territorial governance for forced eradication, especially not aerial spraying. Our two countries have built a close working relationship. That relationship is close enough to allow the U.S. government to trust its partner to implement the voluntary eradication plan that it has laid out. This trust, though, must come with monitoring. The United States, other donor governments, international organizations, and non-governmental groups like WOLA must keep close watch over the coming year or two, to verify that Colombia, the FARC, and coca-growing communities are fulfilling their peace accord commitments. A “trust, but verify” approach starts with patience. Rather than giving political leaders a quick but evanescent “win” for next year’s press release, the new strategy promises to lock in permanent reductions in coca cultivation. And in its remaining year and a half, the Santos government must prove through actions that it is seizing the historic opportunity that the FARC peace accord provides.